Segger is a segmentation and molecule fitting tool for single-particle EM maps. Segger created by Greg Pintilie as a student at MIT in Electrical Engineering and Computer Science. 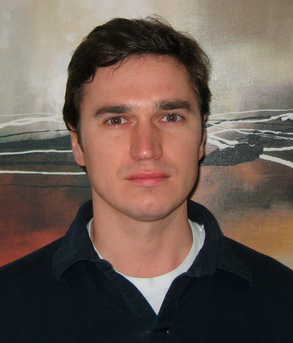 Greg started as a post-doc in Wah Chiu's group last month. Segger is an extension of the Chimera visualization program. Partition density map into regions corresponding to individual molecules. 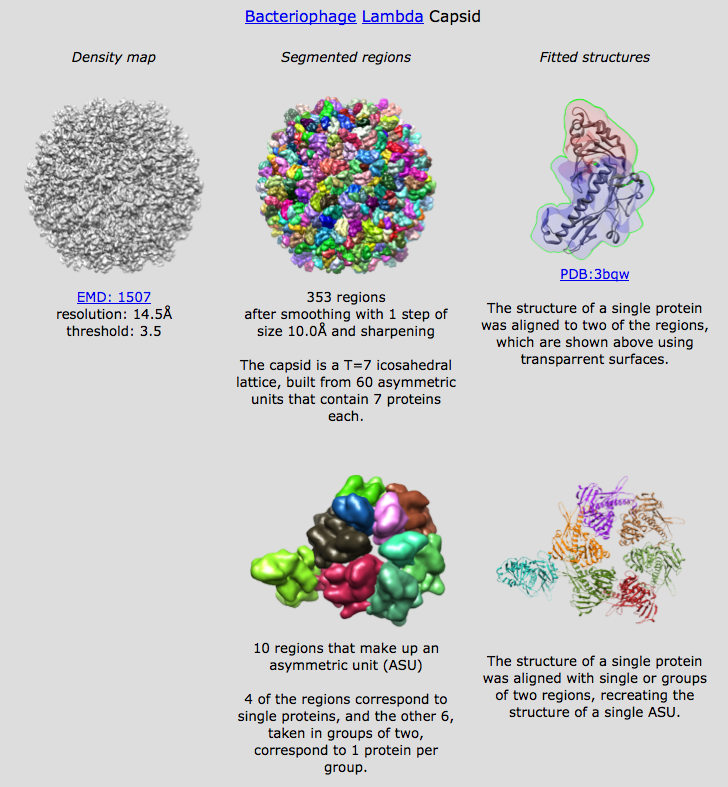 Fit molecular models into regions. Identify combinations of adjacent regions that match a molecular shape and fit molecules within those groups of regions. Learn how to use Segger with two examples (GroEL, bacteriophage lambda). Understand algorithms used by Segger. Install Chimera from Chimera web site. Download Segger from Segger web site. Place Segger folder in Chimera "share" directory. Show groel and bacteriophage lambda examples from Segger documentation. EMD 1080 (Steve Ludtke) and monomer 1xck, chain A. Show Segger dialog. Warn that it is an odd user interface, 8 menus, 3 columns. that reach that local maximum after travelling a steepest ascent point. Mention that only parts of map above displayed threshold used. one molecule. Groel has 14 copies of one molecule. that overlap a single smoothed map region. Set smoothing steps to 5, step size 10, stop at 14 regions. Step size is Gaussian standard deviation (I checked code). Press smooth and group button. seen in comments on the status line. Select a region ungroup it, select an ungrouped region and ungroup again. Select all regions of original selection and group. Show mask map with selected. Fit groel monomer, open 1xck_A.pdb (chain A of 1xck). Choose 1xck_A.pdb in segger dialog. bug where fit goes to wrong region). Note that fit will use a simulated map with specified resolution, grid spacing. Use Align to "selected region". Show molecule axes and region axes. Note that axes not perfectly aligned because of local optimization. properly align with the map. of molecule and region matching. Might show to show how fast it is. be unreliable for spherical shaped molecule. T=7 virus capsid, expect about 7*60/2 = 210 copies of capsid protein. Find and show pentamer looks like regions are whole molecules. Hexamers have some molecules represented by 2 regions. Show asymmetric unit. Select each region of hexamer and one neighbor pentamer. Use "show only selected". Inspect bottom of hexamer for missing pieces. (Intentionally miss one in initial selection). Add missing piece to selection. Show all, Invert selection and delete and delete selected regions. Select pentamer region and fit 3bqw. Good fit except for a beta sheet. "combined selected regions". Fits nicely. I get 25 groups (threshold 2.71), see them counted off in status line. center to most distant boundary point. Use Place button to place 7 copies in top scoring fits. it easier to browse those fits by say clicking an entry in a list.